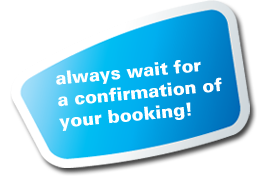 You can book by sending us a fax or going through our digital form. Whatever you choose you are to wait for a confirmation from us. It takes some hours before we reply: we want first to know if the vehicle is available and then if is in perfect riding conditions. We test the vehicle before it is assigned to you! Download our FAX PDF sheet or fill in the form field. fill the forms with the required information or send us the downloaded PDF. You can FAX or send it by email. you’ll be asked some questions about your riding experience. we are to be sure the vehicle you are requesting is available and in perfect riding conditions. do all online, nothing to download, just send us your data electronically. Do not book if you do not have a good riding experience!